I’ve named this crochet pattern “Variety Show Scarf”. Why did I name it that? My kids were working on a theater production, a variety show or musical revue, during the time I was making this scarf. Given the color of the yarn, I thought it was apt. 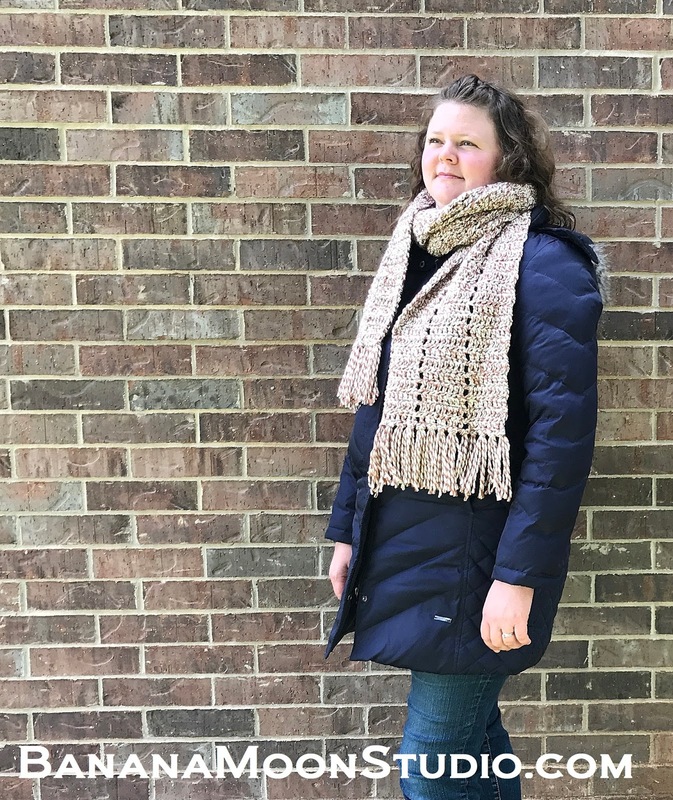 This scarf is stitched in Perfection Chunky, by Kraemer Yarns. I met this yarn when I attended The National Needle Arts (TNNA) trade show in Columbus, OH earlier this summer. I noticed right away that this yarn would make something really cozy. It was soft, squishy, and chunky. I loved it! At the show they were sharing several new colorways that are a 3-ply yarn. Two plies are ivory colored, and the other is a muted color. In this colorway, #7126 Ragg Time, the colored strand is burnt orange. Why did I design it this way? With the very busy coloring of this yarn, I wanted to keep the stitches simple. Texture or lace patterns tend to get lost when you stitch them with non-solid colors. The simple stitches in this pattern allow the yarn color to be the star of the show. I also like to have patterns available for lots of different kinds of crocheters. Sometimes, a stitcher just wants something easy. And why make such a large scarf? Because it is SO cozy! Also, I’m tall, so I like a looooong scarf! Yarn: Kraemer Yarns Perfection Chunky (30% Domestic Merino, 70% Acrylic; 120 yds (110 m); 3.5 oz (100 g); CYCA weight: 5/Bulky): #7126 Ragg Time, 4 skeins. Crochet Hook: M/13 9.0 mm crochet hook, or size needed to obtain gauge. Gauge: 11 sts x 5 rows = About 4 ¼ inches (11 cm). Notes: Scarf begins at one short end and work progresses toward the opposite short end. Fringe is added in the finishing step. Row 1: Dc in 3rd ch from hook (ch 2 does not count as a st), dc in next 7 sts, *ch 1, sk next ch, dc in 8 chs, repeat from *, turn – 24 sts. Row 2: Ch 2, dc in 8 sts, *ch 1, sk ch sp, dc in 8 sts, repeat from *, turn. Repeat Row 2 until you have completed 110 rows. Fasten off. Cut 56 pieces of yarn, each of them 10 inches (25.5 cm) long. See my technique for a simple way to cut your fringe pieces. Place 4 pieces together, ends even. Don’t be uptight about perfection here, you can trim ends later if you have a piece that is much longer than the others. Fold a group of 4 in half. With RS of scarf facing you, insert a crochet hook from back to front of the first st or ch on one short edge. Pull the fold of the group of four yarn pieces through this st or ch with the crochet hook. Pull the 8 ends of these yarn pieces through the loop that you just pulled through the st or ch. Pull snug, but don’t overdo it. Repeat this procedure in every other st or ch, so that this short edge has 14 groups of fringe pieces. Repeat for second short end. Your scarf will probably not need blocking. Weave in ends. This yarn can be machine washed and dried, however, if you machine wash and dry it, the fringe pieces will come unplied and somewhat frizzy looking. I suggest handwashing and lying flat to dry to keep the fringe looking nice. 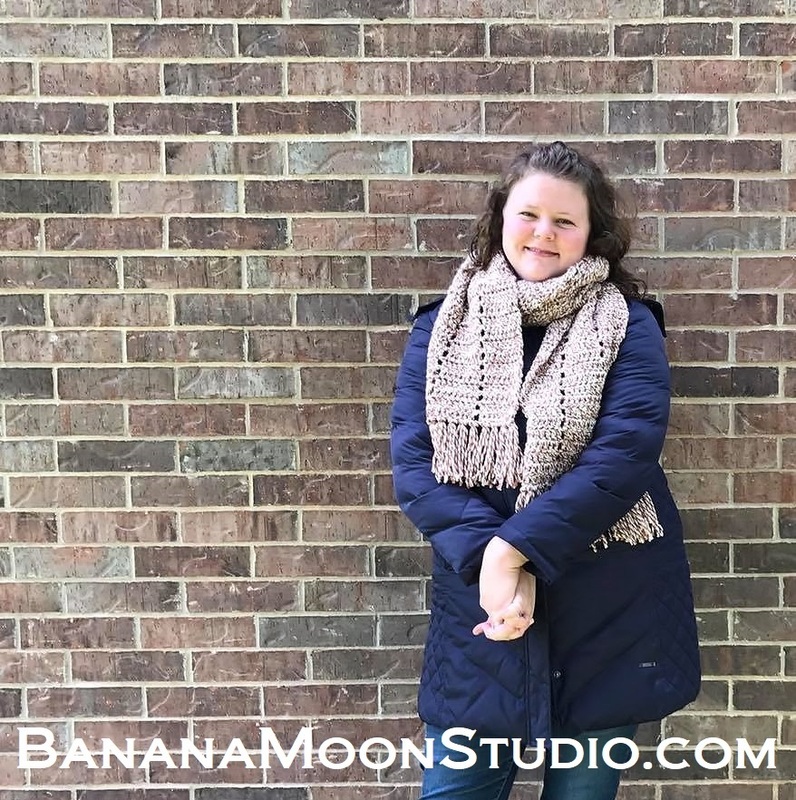 Are you looking for other scarf patterns? 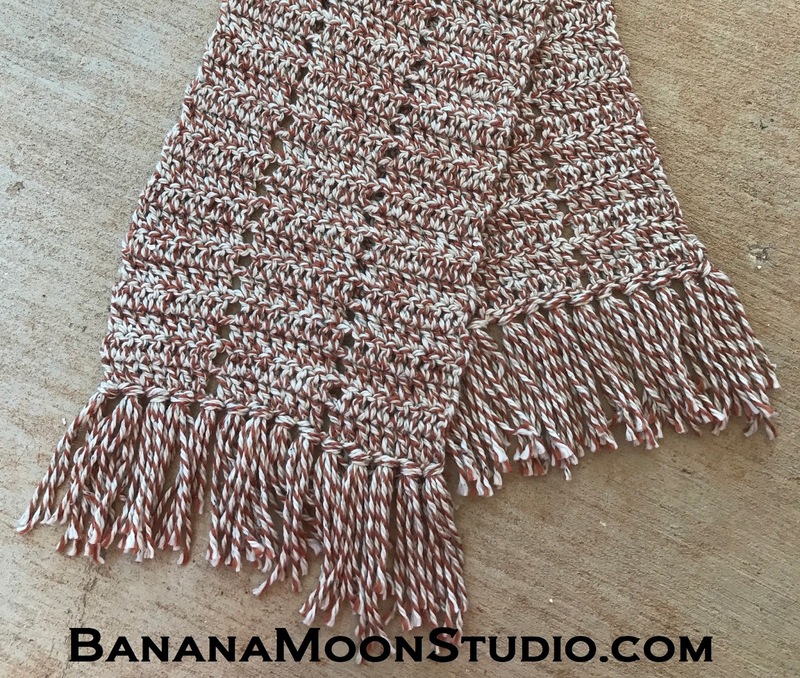 Brassica Scarf – an asymmetric, textured beauty! 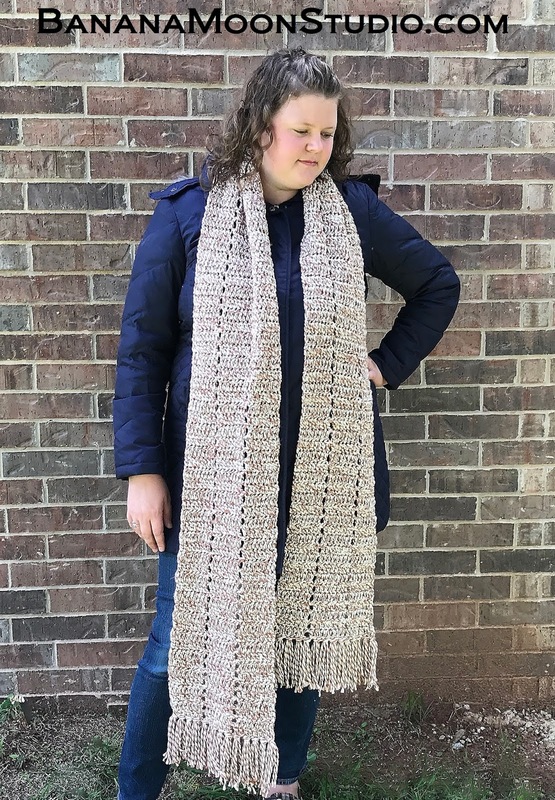 Sierra Scarf – a fun ruffled scarf that you can also wear as a cowl! Flyover Scarf – use up extra sock yarn to make this fun infinity scarf! What kinds of scarves do you like? Lacy, thin, thick, long, short, bulky??? Comment below and let me know! I like lots of different kinds of course, but I can’t wait to wear this one this winter!